Next Monday is the first meeting of the newly restructured Financial Performance and Contracts Committee. You can view the committee papers here but I warn you they are a long read. This committee last met on 27 February, 4 weeks before year end. At that point no significant mention was made of the poor financial performance. Four months is far too long to wait for a committee dealing with such important matters. Maybe it was because Barnet or Capita were too ashamed of the results. CSG run by Capita had a dismal performance including failing 18 contract indicators. But not to worry. The footnote makes it clear that although they had all these failures, none of them count as a contract failure so that's Capita off the hook. I absolutely despair of Barnet's ability to enforce performance on these contracts. Capita run Re also turned in an appalling financial performance. At the committee meeting on 27 February they showed a net overspend of £285,000. By financial year end, 4 weeks later that had increased to £6.7 million. Someone somewhere was not doing their job to have such a massive change in financial performance in the last 4 weeks of the financial year. I would also draw your attention as to how they change the format between reports to make comparison a bit more confusing. Of critical importance at this meeting is the dire financial situation and what it means for Barnet residents. This financial year Barnet has to make an additional £9.5 million of savings. That is on top of the £9.9 million of savings they have already budgeted (but may fail to achieve). What is worse is that while the reports detail the failings there is no clear indication of how these problems will be resolved. The reports also uses positive narrative and spin to make the situation less serious than it really is, a worrying approach if councillors aren't super vigilant in interpreting what they are being told. 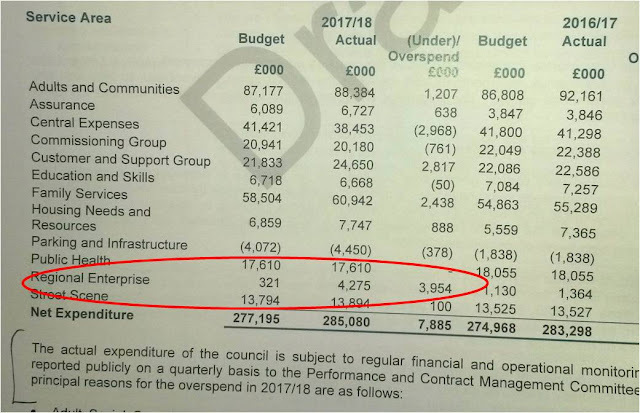 Last year Barnet had to use £21 million from reserves and balances to fund the overspend, a situation which is entirely unsustainable but I see no prospect of how they are going to close the budget gap this year. Set out below are questions I have submitted to the committee. As always I have low expectations of whether they will be adequately answered. I will update you after the meeting. On 27 February 4 weeks before year end this committee was made aware of an overspend after adjustments from reserves of £4.232 million. In 4 weeks that overspend almost doubled to £7.885 million. Why was there such a serious under reporting of the financial position at the last meeting? Given that this committee was not alerted to the scale of the financial overspends at the 27 February meeting, 4 weeks before year end, and only discovered in May when the year-end accounts were being closed, how confident are you that this report provides you with an accurate picture of current financial performance? Do you think that the net draw on reserves and balances for 2017/18 of £21.148m is either acceptable or sustainable and what steps are you going to take to ensure this huge draw on reserves and balances does not occur again this year. 1.2.3 implies that the Policy and Resources committee were aware and approved of all the drawdown on reserves and balances which they were not at their meeting on 13 February, 6 weeks before year end. Do you think the wording of this section should be changed to reflect the fact that such a large shortfall was only identified after year end accounts were closed. In the report it states that the overspend was reduced following drawdown from reserves. This is entirely misleading as the overspend was not reduced. Should the report be corrected to say the overspend was offset following drawdown from reserves as that is a more accurate description of the situation. At this meeting in February most of the budget overspends were identified with one significant exception which is the Re budget. In February the Re budget outturn was forecast at £611,000 with reserve movements of £241,000. On that basis paragraph 1.2.18 entirely misrepresents the situation by saying that the budget was overspent by £3.954 million. Can you confirm that the budget was overspent by £6.7 million of which only £290,000 was identified at 27 February. Of the two overspend items in the Re budget, is the £4.5 million guaranteed income the same element that was identified by the external auditor last year and on which the Audit committee were given solid reassurances by the Director of Resources that they would be recovered? Will you be asking the Director of Resources why they gave such a reassurance last year that has failed to materialise? Please can you explain why it took from July last year until after year end before this committee were made aware that this amount was not recoverable? Please can you clarify specifically what you mean by the sum being “accounted for within the HRA budget” given that this sum is not reflected in the HRA budget outturn at Table 3? Can you clarify specifically what the legal advice said as to why the “guaranteed income” should not be included in the General Fund revenue account? If the other major Re overspend of £2.647 million was a contractual liability, why was it not recognised in the performance figures sooner so that other budgets could be adjusted before year end to reflect the liability? At 1.2.23 the report states that “net pressure” is £9.5 million. Can you confirm that this is in addition to the planned savings already forecast of £9.932 million meaning that total savings required this year are £19.432 million? Given that we are three months into this financial year what is the latest update on the realisation of this £19.432 million of savings? How confident are you that the narrative in this report is balanced and that it provides a true picture of performance? At 1.6 in the report it states that six performance indicators were not met yet at 1.7 the report states that Cambridge Education only failed to meet one contract indicator. Does that mean that the commissioning and corporate plan indicators are not the contractual responsibility of Cambridge Education? The report identifies indicators not met but no reassurance is provided as to how they will be met in the future. How can we be sure that these indicators will have been met when they are next reviewed? At 1.8 no mention is made of the massive financial fraud that took place last year and which it appears was able to take place as a result of failing in the internal financial controls which are the responsibility of CSG. Can you tell me why this was not included in the report? The report states that “a review of internal financial controls was undertaken and improvement implemented”. Is this the Grant Thornton Project Rose study, and if so when were these improvements implemented and will the report either be made public or circulated to members of this committee in private session/ “blue papers”. The report notes that a gainshare working group was set up to review the application and reporting of procurement gainshare. Please can you provide me with more details as follows: what are their terms of reference; who attends the working group; how many times have they met so far; do they publish minutes; what is the timescale for producing a defined output; do Capita attend these meetings; will you be taking public evidence; and will the findings be made public? How confident are you that the gainshare savings stated are real and specifically as a result of Capita expertise or could they have been achieved using standard framework contracts available to local authorities? When I checked on the 23 May 2018, the contracts register for 2018/19 was on line and showed that 112 contracts had expired before the start of the 2018/19 financial year. On 23 June 2018 the data set had been removed from the Barnet Open data portal. What is going on, it the contract register being maintained up to date, how many contracts are currently being used that have expired? For 2017/18 I understood that the in-year Council Tax and NNDR collection rate were guaranteed at 98.0%. On that basis why is the in-year council tax collection rate shown as only 96.02% and only 96.89% for NNDR and will CSG be making up the shortfall? There are a large number of KPI’s not being met or performance is worsening yet the report does not appear to identify what steps are being taken to ensure they situation improves. How can we have any confidence that these matters are being adequately addressed and that this time next year the situation will have improved? Do you think it would be helpful to inform committee members that the caseload charges over and above the core fee for 2017/18 were £190,953 and that CSG customer service volume excess charges were £247,000? Given that the council has now introduced monthly financial reporting can you include in the terms of reference that the quarterly financial reports must reflect a rolling quarter’s data i.e. the three months figures immediately prior to the committee meeting as a way on ensuring you get the most timely and accurate information. When the report says the CFO’s report will give a “broad look” at financial performance it creates ambiguity and risks failing to provide you with important detailed information. Given the content of the report are listed do you agree that the term “broad look” should be deleted and include the words “and any other information the committee deems important for the monitoring of financial performance”? Do you think it would be advisable to add in the following phase: “The report must be provided in a consistent format which not only allows immediate transparency but facilitates the easy identification of trends in performance over a period of time”? Will this report include details of the Budget Recovery Plan, progress on non-essential discretionary spend controls and any SPIRs that have been frozen? Will the report give details of the Capita contract negotiations – even if they are provided in private session/within confidential “blue” papers? Given that staffing and agency costs are a major source of budget overspends surely this committee should receive details of staffing, incl. headcount, FTE, agency and sickness absence as these are financial performance issues not policy issues? For the avoidance of doubt, who is the Chief Finance Officer as there is no such post in the LBB senior management structure; are they a Capita employee, the Head of Finance or the Director of Resources/S151 Officer. Will the S151 Officer attend these meetings? Why are we waiting until September to get a report on agency spend when it represents such a major cost to the council given that we will be half way through the financial year at that stage and have less opportunity to act on the findings before year end? Since the start of the Capita contract I have been concerned about the cost of "special projects" which are billed as an extra on top of the contract price agreed with Capita. In particular, these projects are charged at an agreed consultancy day rate, listed in the contract but redacted from public view. This has concerned me given the enormous size of the special projects bill. In 2016/17 special projects cost Barnet residents £16.8 million - that's on top of the core contract fee of £29.48 million they already receive. The contract stated that the day rates would be commercially sensitive for three years so last year I duly asked for a copy so that I could see exactly how much we are being charged for each project and to assess whether we are getting value for money. While some of these projects need very specialist expertise, some could be done by salaried staff at a much lower cost as a council officer confirmed to me at a council meeting. 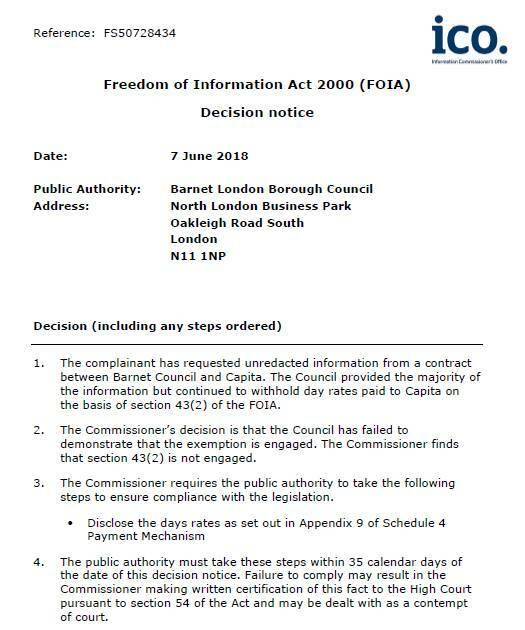 With Barnet having refused to provide these day rates and refusing an internal review, I took my complaint to the Information Commissioner's Office (ICO). After some prolonged deliberation they initially came back saying that Capita had stated that disclosure would undermine their ability to compete in the market place. Barnet Council also objected saying that disclosure would undermine their ability to secure other consultancy at competitive rates. I argued that if the day rates were higher than the marketplace then we should know and it might encourage Barnet to renegotiate them with Capita. If they were low it would help to drive down rates from other consultancy contracts. I made it clear to the ICO that Barnet was under severe financial pressures and keeping the details of such a large cost secret was not appropriate especially as both Capita and Barnet had signed a contract saying the day rates would be released after three years, a contract to which residents may not be a signatory but are definitely a stakeholder. After another prolonged period I heard last Friday that the ICO had ruled in my favour and required Barnet to publish the day rates. They have now published the full judgement on the ICO website. You can read it in full here. I wait to see if Barnet appeal the decision or publish the information. 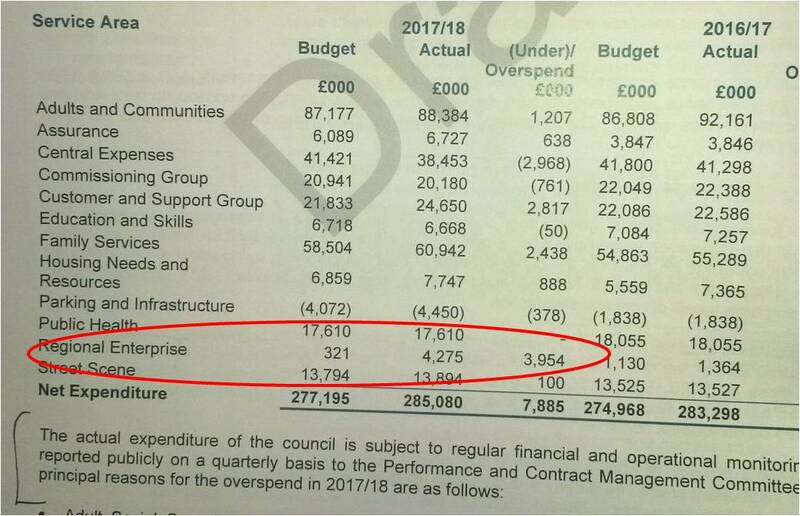 Reading the Barnet Council draft accounts I was curious to understand where the overspend in 2017/18 occurred. There was a lot of talk about the growing demands for family services and adult social care and sure enough some of the overspend was down to that. But what jumped off the page was the biggest single overspend of £3.95 million. Guess where? 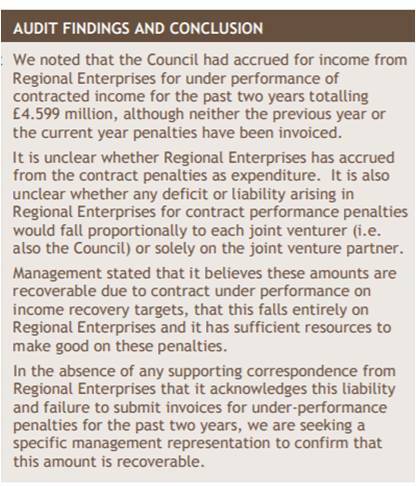 The Capita run Re (Regional Enterprise) contract. What I can't understand is that on a contract that is supposed to guarantee financial performance it ended up costing us nearly £4 million extra. I have consistently said at Council meetings that there is no financial transparency on the Re contract and I keep being told not to worry. Indeed on 27 February 2018, I raised the issued of transparency and Re's performance at the Performance & Contract Management Committee. At that meeting the report showed that Re was overspent by £285,000 and that with a top up from reserves that brought it down to £44,000 overspend. This was apparently down to legal costs which are contractual liabilities payable by Barnet as you can see in the note below the table. Just to be clear, this was 4 weeks before year end. So four weeks later the overspend has jumped from £44,000 to £3,954,000. I will be asking why this overspend has occurred but my concern is that it may be linked to the disputed invoice of £4.599 million identified at last year's audit. This was due to a shortfall in guaranteed income promised by Re. At the Audit committee meeting last year I was reassured by the Director of Resources that this sum would be recoverable but I also noted that the Capita Partnership Director described it as a "disputed" amount. I blogged about it here and expressed my concern that little or none of it would be recoverable. That looks to have come true and the debt has been written off. I may be wrong but given the size of the sum and the fact that it occurred after quarter 3 results, this appears to be the most logical conclusion. We are now at a tipping point. The CSG contract is under-performing with the Council considering bringing part of the finance function back in house; the Re contract predicated on guaranteed income appears to unenforceable. There are other matters which will come to light by the next audit meeting, which I cannot disclose at this time but which will have serious repercussion for the entire Capita contract. Barnet must recognise the reputational and financial damage that these Capita contracts are inflicting and do the right thing. End the contracts with Capita. I have spent the last eight years trying to get Barnet Council to act in a more financially responsible manner. Last night we saw just what a policy of constant Council Tax freezes and poor management has done for Barnet finances. I blogged about this last week which set out my concerns and the questions I had submitted to the Policy & Resources Committee. Last night I got answers, although not to the questions I had asked. That is the Barnet way and something I have come to expect. They didn't find out about the budget shortfall until May, after the election when they were closing the final accounts - although Cllr Cornelius' throw away line that "Purdah was unusually strict" seems to undermine that answer. 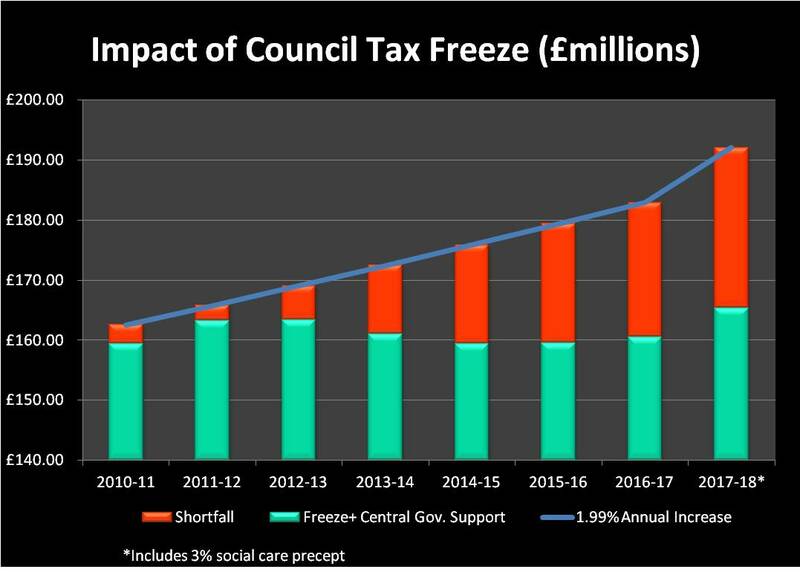 Even though Barnet forecast these problems 6 years ago in the graph of doom they do not accept that constant council tax freezes have turned it into a reality. They will now hold another meeting in July to decide what they are going to do to try and sort out this mess and to consider an option to bring strategic finance back in house. They are thinking about potentially introducing a freeze on recruitment - something they should be doing today. Actively monitoring payroll on a monthly basis is "challenging"
They will be reviewing all capital projects but they can't say which ones. They will have to think about different strategies to address the increasing demand for adult social care. They are going to start public consultation in July on the radical changes to the council needed to balance the budget. Barnet will seek to recover the costs of up to £500,000 from Capita for the the investigation into financial reporting being undertaken by Grant Thornton. And even though they have already paid Grant Thornton £138,600 on this review of financial reporting they haven't yet agreed the workplan or the objectives of the study - something I simply do not believe. I have set out below the speech I gave to the committee, Labour councillors listened and I was pleased that they proposed an additional recommendation to consider bringing strategic finance back in house, something which will be considered at the new July meeting. This is a financial mess and nothing in this report shows me how you are going to get out of it. We need to make massive savings quickly but all I see is inertia. From where I am sitting Barnet looks to be on the same trajectory as Northamptonshire County Council. Decimated services and mass redundancies. Rather than spend my 3 minutes going through the reason as to how you have got us in this mess I thought it would be more constructive to give you my views on how you can try to address the problem. Put a ban on all new recruitment without CEO or 151 officer approval. It mentions it in the report as a possible option but it needs to happen straightaway. Force HR to come up with a clear plan of how they are going to cut agency costs to 2010/11 levels (£9m). Review the flash figures for payroll within three days of month end and challenge any unbudgeted spending immediately. Take a leaf out of Northamptonshire’s restructuring playbook for financial control and implement an independent procurement panel to review all expenditure over an agreed limit of say £10,000 including all Capita special projects. You also need to get a much stronger grip on capital spending . If you can cut capital projects to balance the books then maybe they shouldn’t have been approved in the first place. Renegotiate the Capita and Re contracts with the first target being the gainshare arrangement which appears to be a licence to print money, £23 million on procurement alone. The financial function isn’t delivering and right now you need a clear joined up financial perspective with timely and accurate reporting. The logical solution to get that control is to bring it back in house as quickly as possible. The Barnet Group has a large duplicate management structure including CEO, Finance Director right down to a duplicate FOI department. Five separate boards 20 different board directors. Barnet homes management costs are £21.1 million yet operational costs are half that. Re-integrating Barnet Group within the council structure could rationalise the management and duplicated admin function taking out a significant chunk of those costs as well as providing a more integrated and efficient service for users. You duplicate many roles by having commissioning officers on 6 figure salaries and then pay Capita, Re, Cambridge Education etc for senior management to implement services. This needs a radical overhaul which I suspect will mean bringing more services back in house. This isn’t about political dogma it’s about plain speaking common sense, something which has been absent for a long time in Barnet. Pledgebank promise to review monthly spending from 2011. "I will pledge to give up 4 hours of my time every month to scrutinise and challenge all invoices over £10,000 to help the Council reduce unnecessary spending so long as five other people will make a similar time commitment to sit on the panel and that Barnet Council will genuinely participate in the process and listen to the advice and opinions given." On Tuesday Barnet Conservatives voted to end the brown bin food waste collections in Barnet. Instead people will now be required to throw their food waste in with general refuse and it will be burned in an incinerator at Edmonton. The reason for this retrograde step is that it will allegedly save £300,000 a year or roughly 4p per household per week. In addition, what is left at the end of the process is sold to farmers as fertiliser and is a direct replacement for chemical fertilisers, typically made using fossil fuels. From an environmental perspective it just seems to be the right thing to do and is supported by both Central Government and the London Assembly whose paper in March 2018 made separate food waste collections a key recommendation. 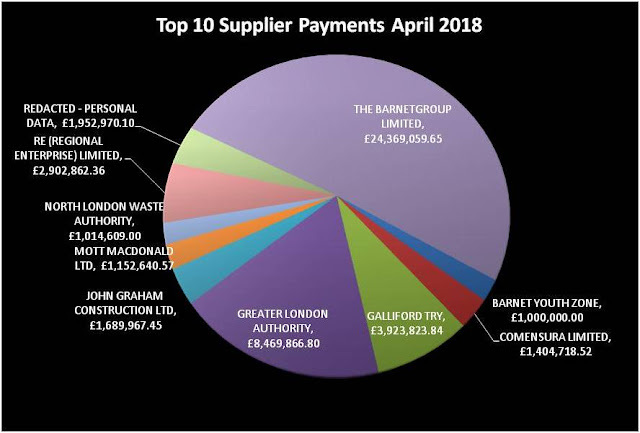 Barnet have to pay to process the food waste but because it is such a good quality "feedstock" for the anaerobic digester (AD), it is highly valued and as such the price paid to process food waste is much lower than for other products used at other facilities such as sewage slurry. Barnet will now send the food waste for incineration, a process which is much more harmful to the environment that AD. Don't take my word for it. 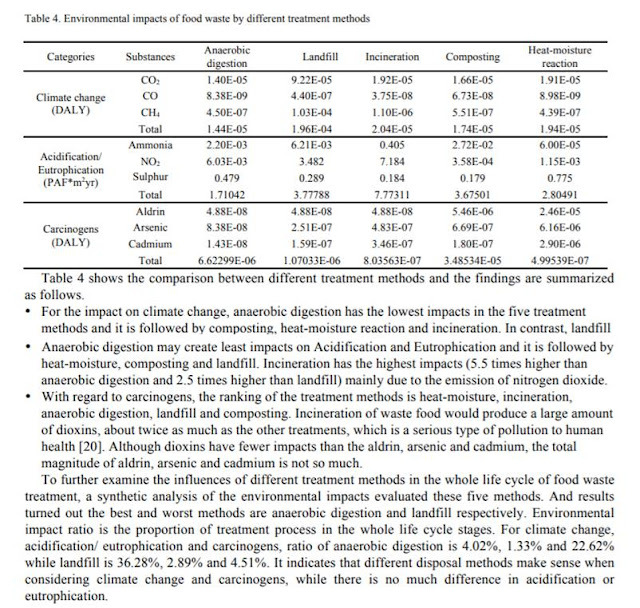 Below is an extract from a scientific paper submitted to The 8th International Conference on Applied Energy – ICAE 2016 "Comparison between the technologies for food waste treatment" which you can read in detail here. I know it looks a bit technical but the key facts are that incinerating food waste is much worse for the environment that AD. 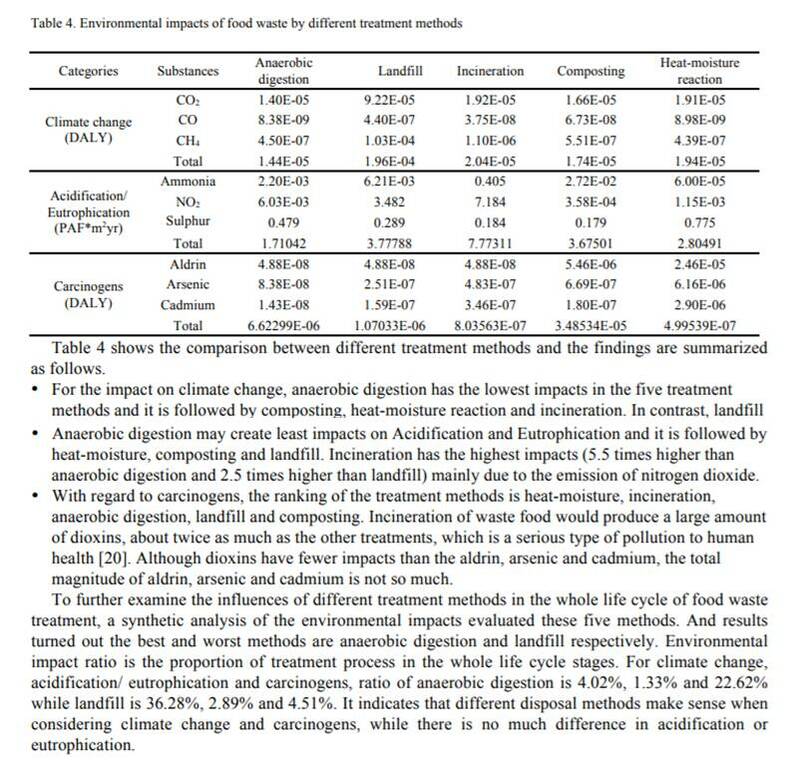 Incineration of food waste generates much more nitrogen dioxide and twice as much dioxin, a substance harmful to humans, than AD. This week I have spoken with four different AD operators in the London area. All expressed their surprise that Barnet would be taking such a retrograde step. All said that household food waste is a highly valuable feedstock for the AD process because it generates so much energy and that 100 tons a week, consistently throughout the year, would make it an exceptionally large and attractive contract. So now let's look at the alternatives, the ones that weren't discussed at the meeting. Before the election Barnet Conservatives made much of promising to retain weekly bin collections. However at the same time they recognised that recycling rates have fallen back and we are miles away from achieving the 50% target they set. A number of boroughs have moved to fortnightly general waste collection not just to save money but because it forces people to recycle more. In Barnet the obvious solution would be to retain weekly recycling collections, blue and brown bins, and to move to fortnightly black bin collections, incentivising people to recycle and to divert more of their food waste to the brown bin. I don't have the specific figures but I am sure that cutting black bin collections to once a fortnight would save a heck of a lot more money than cutting brown bin collections which are picked up at the same time as the blue bins. The problem is Council Officers were unable to offer that option because the Tory manifesto said they would keep weekly bin collections. It is also worth noting that by scrapping the brown bin collections it will make it impossible to shift to fortnightly black bin collections in the future because the food waste will stink after two weeks especially during the summer months. The final nail in the environmental coffin is that the redundant brown food bins and kitchen caddies from every household won't be recycled - they will be burned in the Edmonton incinerator. Financial Meltdown in Barnet - Should we have been told about this before the election? So whereas in February they were forecasting a shortfall of £2.79 million in 2018/19 they are now forecasting a £9.5 million shortfall and in 2019/20 the shortfall jumps from £8.2 million to £19.3 million all in the space of four months. The long term prospects are apocalyptic with a shortfall of £42 million in 2021/22 and by 2023/24 a "high level calculation" showing a shortfall of £62 million. This means the council can no longer exist in its current form. I simply cannot believe that in February - before the election - no one was aware of just how bad the financial situation was, in which case were the electorate misled? The committee meeting dealing with these matters is next Monday and I have submitted questions. Will I get any answers? Unlikely. The MTFS indicates a budget gap for this year of £9.45 million and a gap next year of £19.27 million yet at this committee in February there was no forecast gap for this year and a gap of £6 million next year. What has happened in 4 months to have made such a huge difference to the budget shortfalls? At the end of Q 3 2017/18 the forecast outturn was a shortfall of £6.6 million yet by year end the shortfall had risen to £13.5 million. Did something dramatic happen in Q4 or is this a problem of poor/out of date financial reporting and if so who is to blame? At 1.5.4 it proposes a new corporate plan for April 2019 reflecting the Conservative manifesto including keeping council tax low. Given that in the final year of this administration the budget shortfall is forecast at £42 million do you think keeping council tax low is prudent or denial of the financial reality? If the high level calculations for 2023/24 prove to be correct in forecasting a £62 million budget shortfall, who should I hold accountable for this financial apocalypse? By reallocating the NHB to support the revenue position it will cost an additional £1.3m per annum in capital financing. Is this simply storing up problems for later years? If the current S151 Officer believes that we should have a reserve of £15.1 million why did the previous S151 Officer allow it to fall to £9.6 million at the start of the last financial year? If this committee had been made aware of the seriousness of the financial situation in February do you think they would have still voted to freeze council tax (excluding the social care precept) for this financial year? These budget shortfalls do not include the impact of the additional cost of borrowing to complete the Brent Cross Thameslink station. When that is factored in what is overall forecast budget shortfall for 2019/20 and 2020/21? Who was responsible for making you aware of the additional borrowing requirement for the Brent Cross Thameslink station and why didn’t they do it sooner? At 1.5.14 you identify managing demand as a way to reduce the budget gap. Given that you have been saying that for at least the last 6 years since you published the graph of doom and that it is a policy that has repeated failed to deliver, do think you need to change the people who keep recycling this approach. The report talks about radical options for the future of local services but fails to mention any engagement with local residents at the early stages of this process to help develop these options. Please will you confirm that you will publish a resident engagement/involvement plan before the process commences. Given the foregoing issues raised under agenda item 7 and the need to cut capital borrowing why is the council considering making a 30 year loan to Saracens to enable the construction of a new West Stand at Allianz Park? Given that Capita are responsible for the finance function in the Council why is Barnet paying for Grant Thornton support following a review of financial procedures and practices? Before confirming a spend of up to £500,000 what are the specific objectives of this exercise and how will you measure whether their input has met those objectives? As you may know I keep a running track of supplier payments each month. April's figures were published last Wednesday but reading through them it was quite clear there was a problem. First of all there was £8 million of redacted payments classified as personal data. This is many time more than would usually be seen. In addition there were no payments to Comensura. which are typically between £1.3 and £1.8 million. I asked for Capita to go back and check the data and on Friday they republished the list. Redacted payments fell from £8 million to £2 million, Comensura payment were £1.4 million plus a range of other payments adding up to a further £4.6 million. Interestingly there was a payment of £225,394 to London Borough of Harrow for fuel. This is because Barnet share Harrow's depot for some of the refuse vehicles and have to buy their fuel via Harrow. Are we getting the best deal - who knows but because Barnet messed up the Oakleigh Road depot, which is too small, we have no alternative. Capita had no substantial payments this month but Re had a payment of £2.9 million, surprising given that they received an advance payment of £16 million last year - that must have run out. I do wish someone would check these payments before they are published rather than leave it to the public to tell them they have got it wrong.